Bruce Springsteen has always been one for painting huge sweeping cinematic moments in his rich canon of work… so picture this: Working on a Dream represented an optimistic sea change in 2009. It almost directly coincided with the inauguration of Barack Obama as President of the United States. It finally seemed an upswing was going to happen. 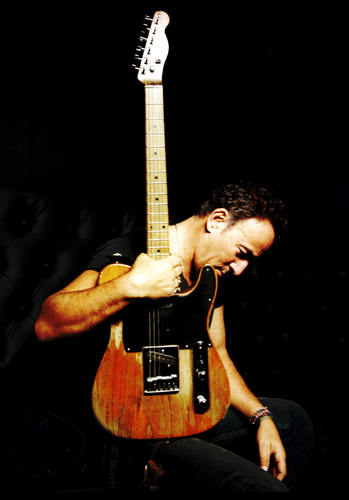 Three years later, The Boss returns with his hand still gripped firmly around the neck of his telecaster looking out upon the greater American frontier. But this time, his hand toughened and calloused, his lungs breathing in a cold dry air, his operatic Roy Orbison-worthy croon hardened into a gruff coal-mining bellow and his eyes dulled and gray, robbed of the vibrancy and hope from WOAD due to corruption, death, and deception. Bruce looks out to the horizon, past countless rows of foreclosed homes to find nothing has been settled. He kneels down and tightens the laces on his scuffed and worn work boots. There’s still a lot of work to be done. The work never ends. 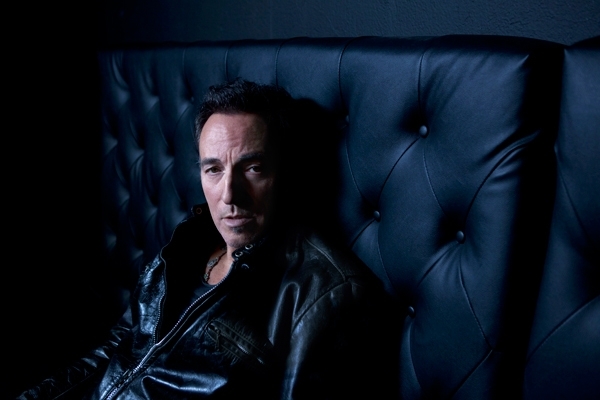 Bruce Springsteen has plenty to be disillusioned about in 2012. As we grow older, the only thing that is certain is that death looms and eventually finds us all and we’ll lose friends and loved ones on the journey. Bruce’s last three studio albums now have each been marred by particularly close and painful deaths. Before the release of 2007’s Magic Bruce’s long-time personal assistant Frank “Terry” Magovern passed away causing Bruce to pay homage to him in “Terry’s Song” on the same album. Shortly after, in the Spring of 2008, organist/accordion player and original E Street Band member Dan Federici lost his battle with melanoma causing Bruce to pen “The Last Carnival” for him on WOAD. Then there was the loss that shook him to the core more than any other. In 2011, Clarence Clemons passed away after complications from a stroke he suffered a week earlier. Clemons was not only an E Street original as well, but in a sense he WAS the E Street Band. He embodied all that was good in the band. He was the heart and undisputed Minister of soul in the band. His saxophone was the backbone and majesty of countless Springsteen classics. It was such a staggering loss, it seemed nearly unfathomable that Bruce could continue with the E Street Band. Then there’s the darkness still prevalent on Wall Street and in Washington. The Capitol’s been mired in tar-thick corruption by a government bickering into perpetual gridlock and the poor and working-class people of America are having their American Dream constantly smothered and sequestered by big banks while they watch their homes literally get taken from them. All of these conflicts provided the fuel and stoked the fires in Springsteen’s guts to create 2012’s baptism-by-fire Wrecking Ball. 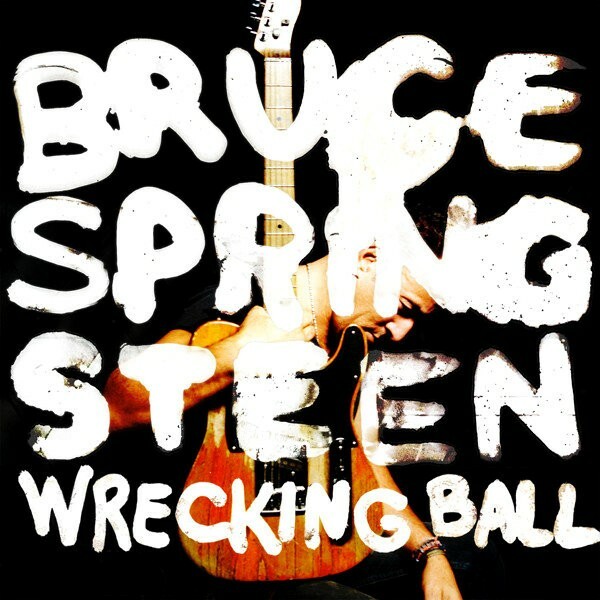 Lyrically, Wrecking Ball is one of the most direct records of Springsteen’s as even he stated. The content and characters are amongst the darkest and harrowing he’s written about since perhaps the social immigration unrest of The Ghost of Tom Joad or the even more desolate and stark Nebraska. Sonically however it’s much more of a deceptive blend. A melting pot of genres and influences which may have actually been spurred by the 2006 We Shall Overcome: The Seeger Sessions which was an unusual success unifying folk standards handed down from Pete Seeger with Springsteen’s freewheelin’ Seeger Sessions backing band. The Grass-roots amalgamation of early American forms of music can definitely be heard through-out Wrecking Ball and the spontaneity of The Seeger Sessions courses through its veins. Bruce however does not forget that he’s always been a passionate disciple of Rock & Roll and may now be its greatest elderly statesman. Cue rafter-shaking opener, the “Badlands” style uprising of “We Take Care of Our Own”. If you look at the chorus by itself A.K.A. listening to it with GOP ears it sounds like a gigantic patriotic anthem, “We take care of our own/ Where ever this flag’s flown/ We take care of our own”. Hopefully the stuffy Right-Wing elephants learned a lesson from Ronald Reagan when he ran for re-election as President in 1984 attempting to use Springsteen’s song “Born in the USA” foolishly and recklessly mistaking it as a towering “Bound for Glory” American monument. A monument indeed but not the one Reagan was skulking around for and anyone that paid an ounce of attention to the rest of the body of the song’s content at all could only shake their heads in dismay. “We Take Care of Our Own” is similar to “Born in the USA”, dressed up in a pop fist-pumping glaze augmented by powerful orchestration that’s actually a scathing indictment of the institution. Seven years after Hurricane Katrina the ghosts still float up Highway 61 from New Orleans conjuring images of the poor left behind to toil in the squalor and foul excrement of the Super Dome. “From Chicago to New Orleans/ From the muscle to the bone/ From the shotgun shack to the Super Dome”. The nightmare scene still lingers. Bruce’s lyrics are as pummeling as the song itself when he laments, “There ain’t no help, the calvary stayed home/ There ain’t no one hearing the bugle blowin’”. It’s a song that reaches past the furthest fan from the stage at any arena or stadium all the way to our government officials, grabbing them by the collar to tell them there are still storm clouds brewing in the homeland. World police can only be played for so long before needing to look inward. “Easy Money” is another deceptively glistening track with a blend of country-fried gospel drenched in fiddle and a clap/stomp drum beat with the same exuberant DNA as “Into The Fire” from The Rising. We come to find that this individual is as lost as Frankie or Johnny 99 heading to town armed with a Smith & Wesson .38. His justice will be swift at the end of a smoking gun barrel if he’s crossed. “Shackled And Drawn” is about as buoyant of a sound as you can get when dealing with the greed of Wall Street. The lyrics eerily echo the sentiments proposed by Woody Guthrie at one point with “The Jolly Banker”. You could easily hear Bruce singing this alongside Pete Seeger at a future Newport Folk Festival as he sings, “It’s still fat and easy up on banker’s hill/ Up on banker’s hill, the party’s going strong/ Down here below we’re shackled and drawn.” Bruce has clearly soaked in the wars waged on Wall Street gathering that the fat cats are still able to have their gourmet cake and eat it too. Then they can wipe their husky faces clean with 100-dollar bills and foreclosure papers. “Jack of All Trades” is a somber blue-collar piano ballad with Hispanic-tinged flavor including South-of-the-border horn arrangements and allusions to Jesus and Carpentry work. Bruce reassuringly stands his ground, growling lines like, “If I had me a gun/ I’d find the bastards and shoot ‘em on sight/ I’m Jack of all trades/ We’ll be all right” before giving way to a searing stratospheric Wah-Wah outro guitar solo by guesting Tom Morello. “Death to My Hometown” is the most rollicking Celtic song Bruce has written besides maybe “American Land” that suggests he’s been hanging out with the raucous lads in the Dropkick Murphys more. Backed by Irish flute and a pulverizing boot stomp, Bruce is on top of his game lyrically here effortlessly pulling Irish Isles poetry from some the darkest wells of his soul. “No shells ripped the evening sky/ No cities burning down/ No armies stormed the shores for which we’d die/ No dictators were crowned.” Or “They destroyed our families’ factories and they took our homes/ They left our bodies on the plains/ The vultures picked our bones.” And “Now get yourself a song to sing and sing it ’til you’re done/ Yeah, sing it hard and sing it well/ Send the robber baron’s straight to hell.” They sound like forlorn passages that could’ve been written a century ago in Ireland. A lamentable tale that doubles as a pint-slosher. You can picture Bruce singing it arm-in-arm with the Clancy Brothers and the aforementioned Murphys in a tavern somewhere on the North side of Dublin. Following that is “This Depression” which is a caliginous dirge with atmospheric crackling bursts of Morello guitar before coming to the title track “Wrecking Ball”. Bruce originally released this song during a 2009 multi-night run in the soon-to-be demolished Meadowlands, home of the New York Giants. The song was initially a tribute to the stadium but now serves a dual purpose. It pays homage to a landmark near Springsteen’s own backyard of New Jersey but it’s also become a ringing clarion-call of defiance of oppressive forces. With the muscular lush backdrop you get the most visceral feel of Springsteen on the record spitting in the face of adversity, by stating, “If you think it’s your time/ Then step to the line/ And bring on your wrecking ball!”. “You’ve Got It” is a slow-burning Delta blues number that meets the lost highway and “Rocky Ground” is the most spiritually beautiful song on the record. This is definitely Bruce at his most righteous sounding like a preacher blasting like a faithful furnace howling, “I’m a soldier!” throughout it. It sounds like a Sunday hymn complete with a backing gospel choir and it has the elements of a Tunnel of Love track but it more so recalls his hauntingly gorgeous Oscar-winning “Streets of Philadelphia” complete with that familiar drum loop. Then comes the album’s centerpiece and its finest hour with “Land of Hope and Dreams”. Fans have been clamoring for years for this song to be given proper studio treatment as Springsteen has been performing it consistently live since 1999. Justice is done to the song as it’s another undisputed classic Springsteen epic in his legendary back catalog at nearly seven minutes. It’s given an additional angelic overhaul and it’s a monumental voyage of redemption and salvation as Springsteen proclaims, “This train, carries saints and sinners/ This train, carries losers and winners/ This train, carries whores and gamblers/ This train, carries lost souls/ This train, dreams will not be thwarted/ This train, faith will be rewarded/ This train, hear the steel wheels singin’/ This train, bells of freedom ringin’”. Then there is perhaps the most ethereal moment when the final sax solo on a Springsteen record of his departed comrade Clarence Clemons comes blasting through the speakers. It’s the welcomed familiar sound that transcends the song itself as well as four decades of music together. A fitting coda for a fallen brother who will eternally remain the heart and soul of the E Street Band. Bruce adds Curtis Mayfield’s “People Get Ready” at the end to give The Big Man safe passage into the immortality of the heavens. For all of us still earthly bound, Springsteen closes Wrecking Ball with “We Are Alive” which just might be his “We Shall Overcome”. It’s a jubilant rallying cry of unity and solidarity even in the face of death over a whistle-while-you-work riff borrowed from the horn section of Johnny Cash’s “Ring of Fire”. Springsteen tries to have optimism in some of the darkest corners singing, “We are alive/ And though our bodies lie alone here in the dark/ Our spirits rise to carry the fire and light the spark/ To stand shoulder to shoulder and heart to heart”. It’s a fitting paean to close out an album filled with bleak tales of despair, a beacon of light burning bright. In many ways Wrecking Ball is genuinely the most American record Springsteen has ever made. We are all descendants of immigrants to this soil, there is no getting around it and it’s only getting more diverse. And as diverse as it has become, so too is the landscape of Wrecking Ball. It’s a conglomeration of traditional Americana folk, Irish balladry, gospel, R&B, blues, country, Hispanic , and even hip-hop influences built on the solid foundation of Rock & Roll that has driven Springsteen and his work for over four decades now. Bruce has given us an undeniably profound and rich modern folk-rock masterpiece. These stories don’t just belong to him anymore, they belong to all of us. That is the truest sense of what folk music is all about. There’s no “I” or “mine” or “yours”, it is empowerment through solidarity. This era has just been made timeless. They should make room in the archive of American folk music and on the Library of Congress recording’s shelves because Wrecking Ball isn’t only a brilliant record, it’s damn important. Alan Lomax would be reveling in its majesty too. The messages are intended to reverberate through the ages and generations. These are still troubling times, but it would seem that as long as there’s still that small glimmer in Bruce’s eye, the promised land can never be lost.